Summer is such a busy time with a packed agenda and it’s difficult to keep up with my daily blog posts, so I have moved on to a new schedule, a non-schedule – the random blog post schedule. I still love you, I am just not able to find the time to blog daily. How do the bloggers who post daily do it? I’ll bet they don’t have a job or kids, or if they do, they have a nanny, a cleaning lady, a personal shopper, a laundress, a cook, a gardener, and a driver. Or perhaps they have more hours in their day. Or…they are not procrastinators and are simply better at time management than I am! 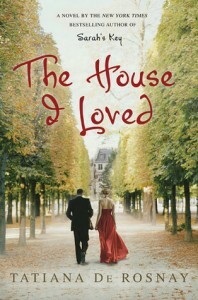 The House I Loved, by Tatiana De Rosnay, takes place in Paris, France in the mid 1800s. By order of Napoleon III, dozens of neighborhoods and hundreds of homes are being demolished, displacing thousands of people, to make way for the large boulevards and the modernization of Paris. Prior to reading this book, I have to admit that I was unaware of this bit of French history. I may have learned, in some European History class, that “Napoleon modernized Paris,” but I had no idea of the impact that modernization had on the lives of the Parisians. The story unfolds as 59-year-old Rose Bazelet writes a letter by candlelight from the unheated basement of their family home to her late beloved husband, detailing the events taking place in the street outside, as the destruction moves ever closer. She is determined to stay in her house forever – her heart, her whole life, and all of her memories are in this home – but will she leave before the demolition reaches rue Childebert? De Rosnay takes us seamlessly between time periods, back and forth from the mid-nineteenth century to the early 1800s, when Rose was first married to Armand and came to live at the house on rue Childebert which is scheduled to be demolished to make way for the grand boulevard Saint-Germain. Full of luscious, Parisian details, the story of this epic, historical event – the modernization of Paris – is overshadowed by the personal history of Rose and her life as it is tied to her home. Rose shares treasured memories of her son, details about a strained relationship with her daughter, the things that she misses most about Armand, her true feelings about her mother-in-law, and she reveals new friendships that she has made since her husband’s death. The book store owner, Monsieur Vincent, teaches Rose the love of reading. Alexandrine, Rose’s tenant and a young, vivacious, flower shop owner shares a very, unique friendship with her. Gilbert, a rag-picker, helps her survive when all of the neighbors have vacated the street. And the Baronne de Vresse who is full of that French je ne sais quoi. Finally, as Rose remembers the past, she is forced to reveal to Armand, and to come to terms, herself, with a secret that she has kept for 30 years. Is it the greatest story ever told? No. Will it become a classic? Doubtful. Is it an enjoyable, French historical fiction novel about a man and a woman and the house that represented their life together? Absolutely. It is a good, quick-read whether you are a Francophile or not. However, as a lover of old homes and everything French, I highly recommend it. Frankly, I would much rather know that you are reading, sitting by a pool and enjoying your children than sitting by a computer reading/writing blog posts. This means you have a life…a great life! Thanks for caring about my life. Hope you’re enjoying your summer, too!